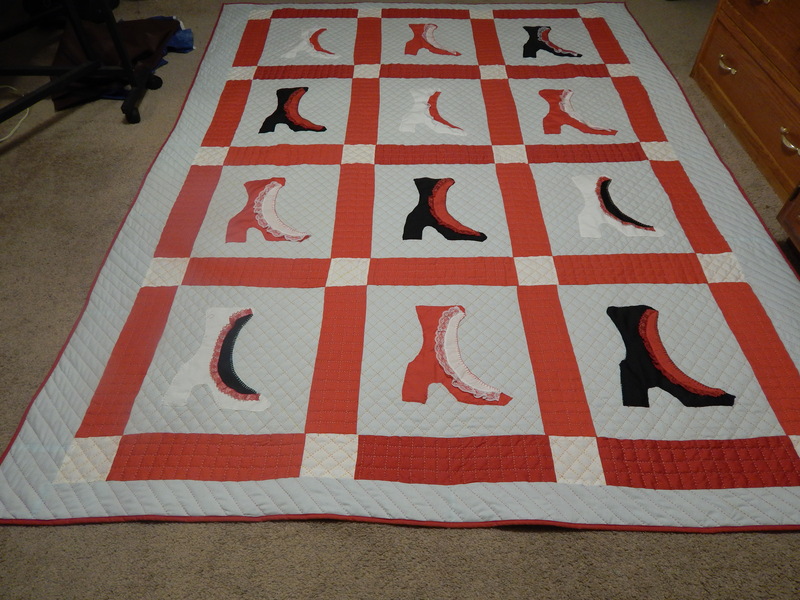 I finished hand quilting the boots quilt today. It might seem like it went fast but I have worked on it night and day …..over 150 hours. Do you sleep?? I am amazed at how much you can accomplish in such a short amount of time! The boots are beautiful and congratulations on the rose quilt!!! How about, you are diligent!? 🙂 Great work! Okay, I for one am not going to say you’re fast. You’re old school, Tim, slow as molasses. It’s only because there are 48 hours in a Tim day that you appear to be fast — but I’m not fooled. You’re the tortoise, not the hare. Both of which would probably send Teddy into a barking frenzy. Which we wouldn’t want. So, we’ll settle on Timspeed. You go at the speed of Tim. Well it took you long enough! 🙂 OK, it seemed fast to people who weren’t watching! I’m sure Teddy would attest to how long it really took! Nice job! Love love love your rose quilt. Diligent! Driven? Sore-fingered? I know that feeling when you know you are overdoing something and you know you will hurt so you keep doing it as fast as you can in order to finish before you hurt so much that you have to stop. I think the boots quilt came out really well. I am amazed at how different a quilt top looks after you have quilted it. It looks a hundred times better! I think Teddy knows what an important quilt it is because he watched you quilt it. Plus, he understands the subject matter from when he was a puppy, nom, nom. I love the way the black border sets off your rose quilt. It is so beautiful (overused word, but so true) and different from all the other quilts. I think I remember seeing this top on eBay, it’s so nice to see it as a finished quilt! Another one saved and it looks so different quilted. Really like your choice of quilting. Your boot quilt is very unusual…. and quilting FINISHED. Always love your work, Tim! Thank you for inspiring us! I confess that I had wanted to continue sending quilts to shows, but lost heart. My work is always complimented highly, but paying to send, send, send just became a cause of disappointment… Do you ever struggle with that? Do you have advice and counsel to suggest to continue? I hope your Rose quilt does very well! It is so beautiful It deserves to win a ribbon! took me forever to find who had them locally. I’ll be using them for the first time this year. Thanks for being inspiring on so many fronts. Boot quilt looks great! AND…. 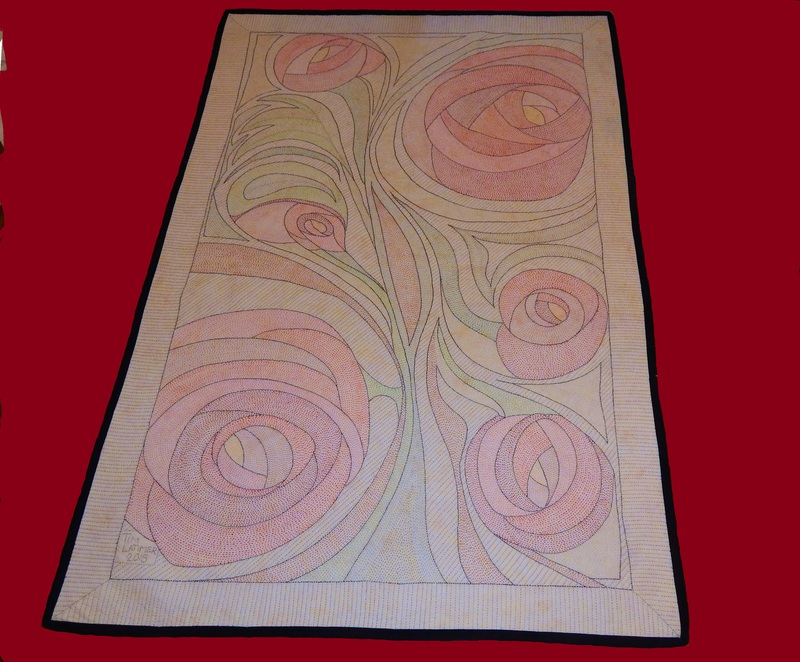 I can’t wait to see the Rose Quilt up close and in person! I’m volunteering to hang and take down, so hopefully I’ll be able to actually touch it. This piece looks fairly good sized. There is nothing like hand stitching. I am inspired to follow your example. I am pulling out a smaller double nine patch and make it my goal–three hours a day over the next few weeks. Thank you Tim.